AMONG THE ELITE East Coast cities, Philadelphia is often overlooked in favor of such coastal metropolises as New York and Boston. At first glance, its roughshod and scrappy atmosphere makes it seem like a place where bookstores give way to bars and not the other way around. Take a longer look, however, and you will see that this sprawling cosmopolitan town has more than enough room for both. While Philly may be known more for its delicious cheesesteaks and crazy sports fans than its novels and poetry, this city of more than one and a half million people is absolutely teeming with literary history and opportunity. Philadelphia’s gray cobblestone streets are filled with beautiful historical landmarks. At Independence Hall, only a short walk from the Liberty Bell, Thomas Jefferson and the delegates of the Second Continental Congress drafted the Declaration of Independence nearly two and a half centuries ago. Edgar Allan Poe wrote many of his most famous works in Philadelphia, including “The Raven,” “The Fall of the House of Usher,” and “The Tell-Tale Heart.” Celebrated poet Walt Whitman spent the final decades of his life across the Delaware River in Camden, New Jersey. These antique brick buildings have been preserved, and modern visitors can still tour the quaint places where world-famous writers lived and worked. Today, an avid literary culture still persists in the City of Brotherly Love. Many quirky and interesting independent bookstores call Philadelphia home, and one such place is Port Richmond Books. Located by the river next to a vibrant Polish neighborhood, this massive used bookstore is housed in a renovated silent cinema from the early twentieth century. It stocks over two hundred thousand books ranging from pulp mysteries to political science to gardening, crammed into shelves six rows high with extras forming haphazard piles on the floor, tables, and chairs. It can be easy to get lost in the stacks and side rooms and spend hours sifting through the endless volumes in the dim light of the overhead lamps. In addition to a thriving culture of independent bookstores, Philadelphia is home to many literary events and opportunities that are open to the general public. The University of Pennsylvania often hosts educational opportunities, such as the Poetry and Poetics Reading Group. This organization meets monthly to discuss modern and contemporary poetry and host events such as poetry readings and presentations by established poets. 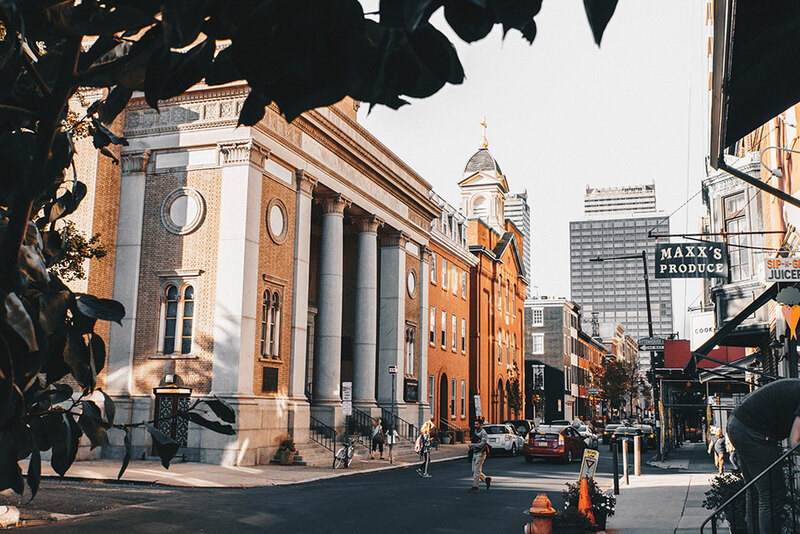 The city also hosts the Philadelphia Writers’ Conference, an annual event offering aspiring writers “instruction, counsel, fellowship, and the exchange of ideas.” The conference includes many different workshops and readings and will be celebrating its seventieth anniversary this June. With its incredible history and endless opportunities, Philadelphia is a city with a rich culture hidden under its tough exterior. If you find yourself nearby, stop in and spend an afternoon delving into a good book from a quiet bench along the river. You won’t regret it. Tyler McElroy is a WLT intern majoring in English writing at the University of Oklahoma. He enjoys reading, writing, and traveling in his spare time. He intends to become an author and plans to see as much of the world as possible after graduating.